The rapper wrote it for CNN. Many sides. One Man. My ancestors plan. 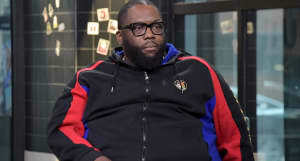 Last December, Killer Mike headed to Washington DC along with Pharoahe Monch, Big Boi, and T.I. The MCs appeared before the Supreme Court and urged the legislative body to take on the case of Taylor Bell, a young rapper who was punished for releasing a song about a pair of high school coaches who were allegedly sexually harassing female students. Mike co-wrote an op-ed about the case this week along with Erik Nielson, an assistant professor at the University of Richmond. "Bell wasn't being punished for making threats against school employees," the pair explains. "Instead, he was being punished for using the wrong art form, rap music, as his voice of protest." This leads to "serious questions about students' First Amendment protections as well as broader questions about the role of race in determining when those protections apply." Mike and Nielson link Bell to a long line of MCs that includes Ice Cube and Eminem. The op-ed argues, "none of their fans ever believed that Ice Cube would kill former Los Angeles Police Chief Daryl Gates, that Eminem would kill his wife, Kim, or that Nas and Jay Z would kill each other—all claims the rappers made in their songs. Likewise, we don't assume that Quentin Tarantino, Stephen King or Johnny Cash carry out the (sometimes extreme) violence depicted in their art—because we acknowledge it as art." Finally, the two men point out that "this isn't the first time officials at Itawamba Agricultural High School have tried to silence and marginalize students they find offensive. In 2010, the school made headlines for canceling a prom rather than allowing two lesbian students to attend as a couple. One of the young women, Constance McMillen, took the school to court to defend her First Amendment rights, and she won."